This Roasted Garlic Rosemary Cheese Bread works equally well as a delicious appetizer, side dish, or even a meatless entree. Roasted Garlic Cheese Bread with Rosemary is great as a side dish, appetizer, or even as a meatless main course. 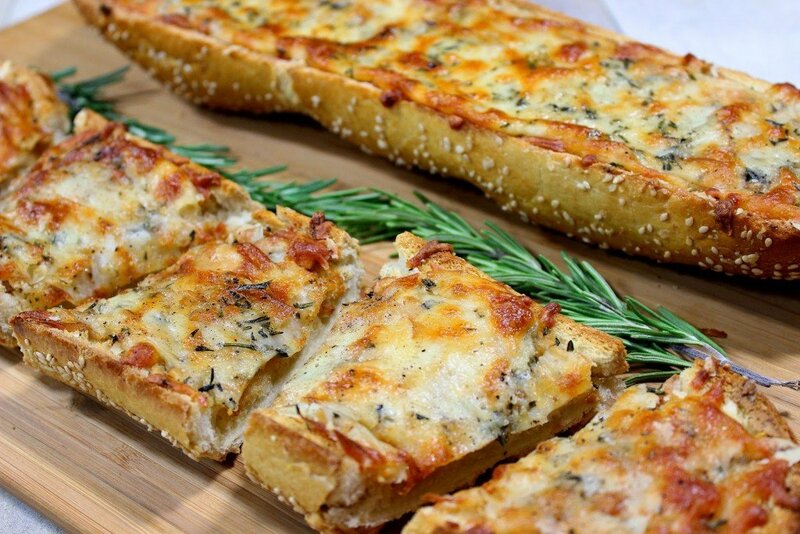 Today’s quick and easy recipe of cheesy garlic bread takes advantage of store-bought and toasted Vienna bread which is then topped with oven roasted garlic, smoked mozzarella cheese, and chopped fresh rosemary. Be still my heart!! 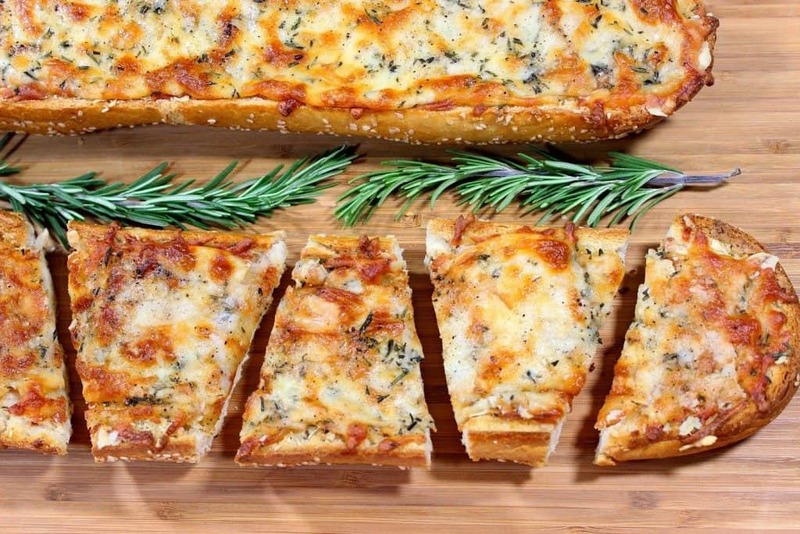 **Please Note – The printable recipe card with detailed instructions, complete ingredient measurements, and nutritional information for making Cheesy Garlic Bread with Rosemary is available near the end of this post. If you’ve never made your own roasted garlic at home, you don’t know what you’re missing. I urge you to try it. The flavor of the garlic turns mellow and a little bit sweet. The softened cloves are not nearly as pungent and overpowering as raw garlic and you can actually squeeze the roasted garlic “paste” right out of its paper-like container. It is quite a lovely thing! How do you make roasted garlic? Wrap the bottom part of the garlic in a bit of aluminum foil. Drizzle the cut garlic with a little bit of olive oil and a light sprinkling of salt. Close the aluminum “package” and place the garlic in a preheated (400 degree) oven to roast for 30-40 minutes. Unwrap and squeeze the roasted garlic out of its paper shell and use it for any recipe where you want a mild, nutty garlic flavor. Making roasted garlic is easy and delicious! Can roasted garlic be made in advance? 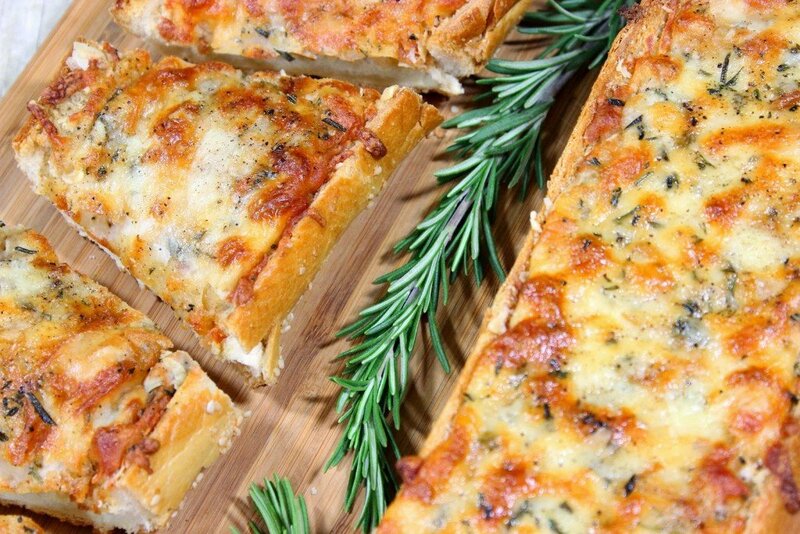 To make this Roasted Garlic Rosemary Cheese Bread a little faster to prepare, plan ahead and roast your garlic in advance of making this recipe. Once roasted you can store your roasted garlic in the refrigerator for up to 2 days. 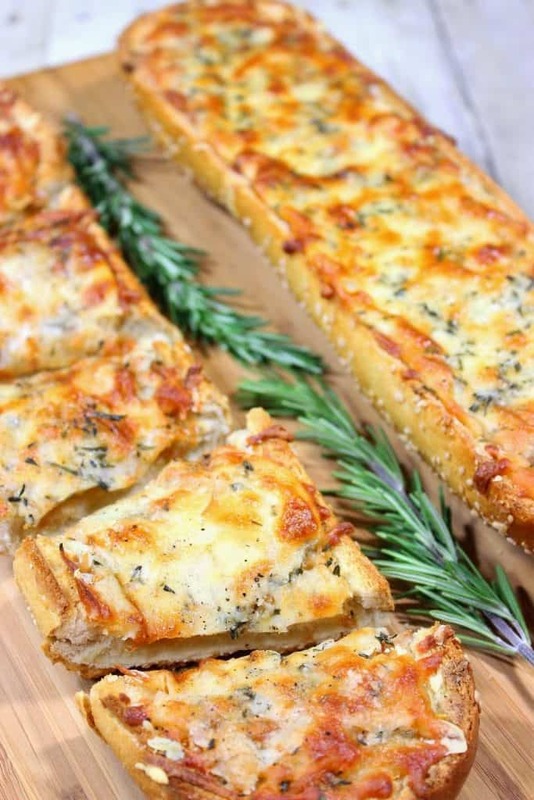 What herbs can be used in place of the rosemary for this garlic bread? 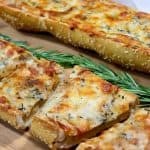 **The following affiliate links are some suggested products I’ve chosen that will aid you in the making and serving of this recipe for Garlic Cheese Bread with Rosemary if desired. Below is the printable recipe card for today’s cheesy garlic bread. Cut the heads off the garlic (approximately 1" down from the top). Drizzle the cut garlic with olive oil and season with salt and pepper. Wrap the garlic in aluminum foil and roast in the preheated oven for 30 minutes. Set aside to cool slightly. Place the bread cut side down on a baking sheet and bake in a preheated oven for approximately 10-12 minutes. Remove the bread from the oven when golden. Squeeze the roasted garlic onto the toasted bread and spread the garlic evenly over the bread. Top the garlic bread evenly with the shredded mozzarella and Parmesan cheeses and sprinkle with minced rosemary and black pepper. Return the garlic cheese bread to the oven and continue baking until the cheese is golden and bubbly (approximately 15 minutes). baking sheet, parchment paper (optional), box grater, cutting board, chef's knife, aluminum foil, serrated knife, offset spatula (optional). I sincerely hope you’ve enjoyed today’s recipe for garlic cheese bread with rosemary as much as I’ve enjoyed bringing it to you! 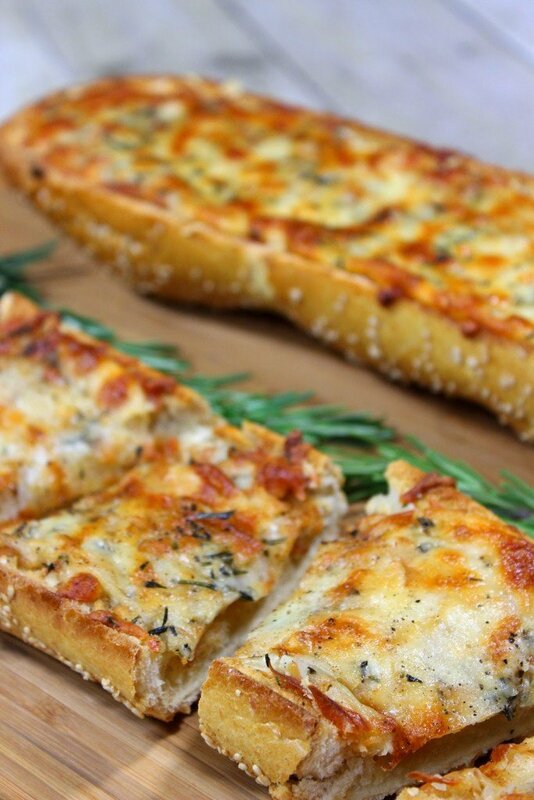 I don’t know about you but I love, love, me do, (Beatles reference) some Roasted Garlic Rosemary Cheese Bread…and a nice glass of wine. What more do you need for a small, intimate party of four? 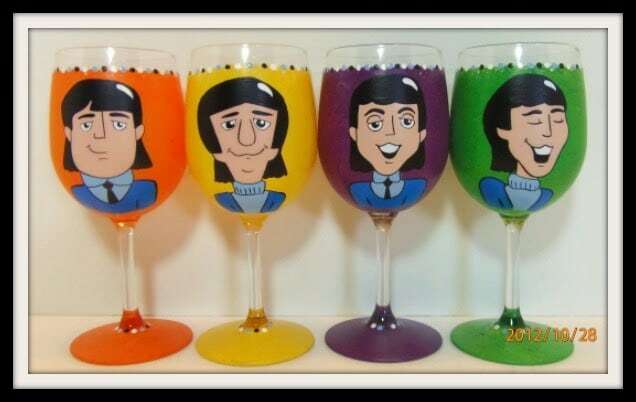 Bread, wine, cheese, and song! Looks amazing! I love everything in this bread. Definitely making it this weekend. I am not exaggerating when I say that my mouth started watering as soon as I saw this bread! And you really can't beat the flavor of roasted garlic. I'm one of those people who has never made roasted garlic at home. This is on my list of dinners to try!! Droooolling! This is my kinda cheesy bread. I like to make a lot of roasted garlic all at one and freeze some of it, so I can have this at a moment's notice. I have to admit I have never roasted garlic at home either. You made it look so simple and easy, now I must try it! I love Roasted Garlic and Rosemary together! It's one if the best flavor combos when it comes to savory food! I just roasted garlic the other day because I made Roasted Garlic & Rosemary compound butter! I need to make this asap cause it would go perfectly with the spaghetti I want to have this weekend! I can NEVER get enough roasted garlic – I want to smoosh it on everything. This bread looks A-MAZE-ING! 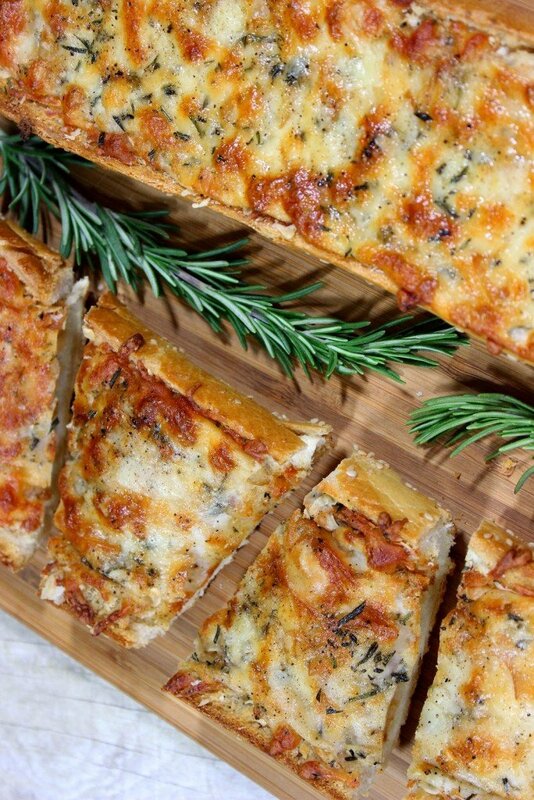 What a delicious blend of flavor from the garlic and rosemary! Just when I thought cheese bread couldn’t get any better! Thanks so much! I’m glad you agree! !